My transceiver is a Wilderness Radio/NorCal Sierra, a multi-band, low-power rig designed for backpacking. 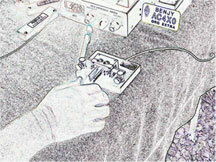 I operated on 40M (at 3 watts), 20M (at 2 watts), 15M (at 1.5 watts), and 10M (at 1 watt). 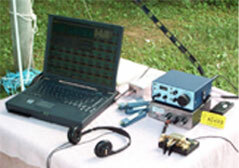 The typical Field Day operation uses 100 watt transmitters. The antenna was a 10M double extended Zepp (a 44' dipole) fed with ladder line. 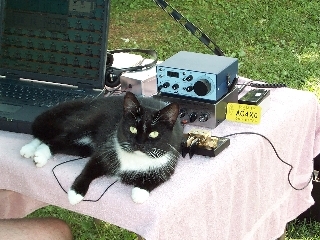 I used an MFJ QRP tuner to operate the antenna on multiple bands. The antenna was erected using an EZHang (TM) slingshot between two trees in my back yard. A Gateway Solo 9100 laptop was used for contact logging using the NA software. Both the transceiver and the laptop were powered from solar-charged batteries. The main battery was a 34 amp/hour deep cycle battery. One 7 amp/hour battery was also used. 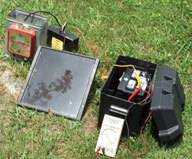 The 5 watt solar panel came from a broken electric fence charger. All contacts were made using CW/Morse Code. I made 210 contacts and claim three bonuses at 100 points each: emergency power, natural power, and copying the W1AW bulletin. I used a Kent paddle for the first time. The cat at the operating position in the picture to the right is Bridget. 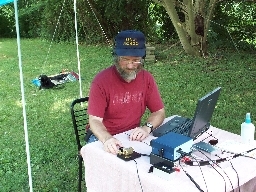 I started working QRP and single operator for Field Day in 1998. I ordered and built the Sierra from a kit and put it on the air for the first time a few hours before the contest began. I was amazed that other station could hear me. I had a wonderful time that year. You can read the full story. Last year, I greatly improved the operation. I worked multiple bands and made more contacts. Pictures and a description are also online. 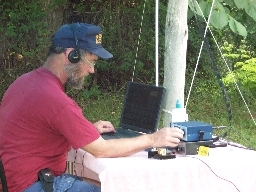 A special thanks goes to Sue Ellen, KD4LQO, who helped with antenna setup, took these pictures, and provided support. Thanks to N4GU for the antenna idea and doing some surface mount work on a power supply experiment. Thanks to Obie, WA4DOX, for loaning me his 20M band module for the Sierra.